BVarsity All-Area Boys Basketball Player of the Year Edward 'Squid' Turner from Foothill High with his father Joe Turner. The two are the first father-son duo to be awarded the boys basketball player of the year award. Joe was named as a senior at Foothill in the 1983-84 season. 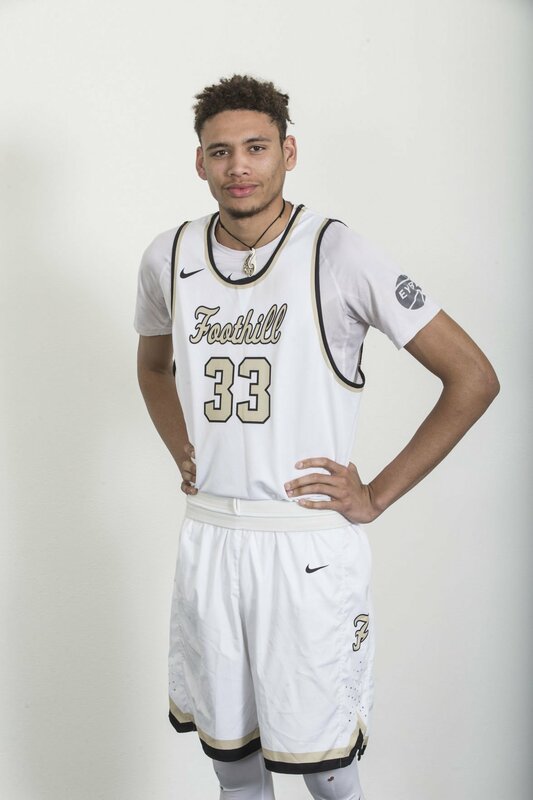 All Area winter sports - Boys basketball player of the year Edward 'Squid' Turner, Foothill High. Edward 'Squid' Turner receives a certificate of special congressional recognition and a gold coin from Rep. Kevin McCarthy. Edward "Squid" Turner brings the ball through his legs during Wednesday's dunk competition. Foothill's Edward " Squid" Turner, left, blocks the shot of Mt. Shasta's Kole Riccomini during the second half of Friday's CIF boys' Division V State High School Basketball Championships in Sacramento. Foothill senior Edward "Squid" Turner slams down a dunk against San Diego-Southwest High School at North High's Gym on Tuesday. The Trojans beat the Raiders 69-55 in the CIF Southern California Division V Regional Championships. The last name Turner means legacy at Foothill High School. Joe Turner was a star for the Trojans boys basketball team in the early 1980s and went on to play at the University of Arizona. Joe’s daughter Jade was a standout on the Foothill volleyball team and also played collegiately at U of A.
Joe spent four years as Trojans basketball coach before handing over the program to Wes Davis before the 2014-15 season. That also happened to be the freshman season for Edward “Squid” Turner, the youngest son of Joe and his wife Elaine. Four years later, Squid Turner led the Trojans to a Central Section Division IV title and CIF State Division V championship in his senior year. When Squid Turner entered the program in eighth grade the Trojans were a four-win team. His final high school season this past winter he guided them to their second state championship in program history. For that historic landmark, Edward "Squid" Turner is the 2018-19 BVarsity All-Area Boys Basketball Player of the Year. The Trojans won eight games Squid's freshman year, but the promise and hype surrounding him was already building — it was tough to ignore 14-year-old standing 6-foot-6 and wearing a size 16 shoe. Turner averaged a double-double his sophomore year as his game improved — a 6-8 wing player that could dribble the ball up court, hit a long-range 3 or throw down a monstrous dunk. The Trojans improved greatly last season, advancing to the D-IV semifinals and making an appearance in the Southern California Regional playoffs. Squid was second on the team in scoring, averaging 15 points. He also pulled down 11 rebounds and swatted away five shots per game on the defensive end of the floor. Then his senior season arrived, and things were turned up to another level. Turner has grown to 6-9 and has a wing-span more than 7 feet wide. His 17.5 points per game led the Trojans in 2019. With fellow frontcourt players Warren Stingley and Elijah Seales joining the team this year, Turner was not asked to battle for as many rebounds. Regardless, he averaged 9.6 boards, 4.7 blocks and 2.4 steals per contest. While he's still undecided on a college, Turner's basketball days seem far from over. Joe and Squid also became the first father-son duo to be named All-Area Player of the Year in the 37-year history of award. Joe's came during the 1983-84 season. “With hard work, dedication and patience, it’s exciting to see the Trojan Turner legacy continue through Squid,” Joe Turner said.